This is the best value on an used 75' Sunseeker yacht for sale! 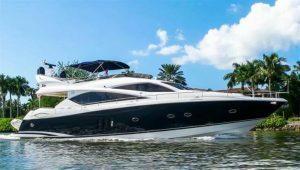 : Atlantic Yacht & Ship, Inc.
Randy Kires brings word of the beautiful used 75′ Sunseeker yacht he has for sale in Florida. In the first place, this yacht was launched in 2006. In addition, this yacht is US duty paid for easy US registration. This immaculate used 75′ Sunseeker is being offered for sale in better-than-new condition. Furthermore the interior has had recent refit works. Moreover the updates and maintenance have been professionally provided. The perfect history of service and maintenance will blow your mind! As can be seen, brand new audio and visual equipment was fitted in 2015. That is just a taste of what this yacht has to offer! This beautiful used 75′ Sunseeker has had a complete refit of the electronics as well! This includes a complete refit of NAV electronics suite both upstairs and down in 2015. You will love her Cherry wood interior. Additionally, the wood interior combines perfectly with the carpets and furnishings. The specifications on this boat were exceptional since new. This beautiful used 75′ Sunseeker is quite simply the most attractive on the market. She is “ready to go” for summer cruising! For more information on this used 75′ Sunseeker yacht for sale contact Randy Kires today!